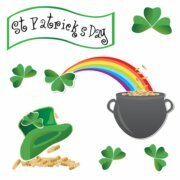 What do you have planned for a Happy St Patricks Day? Just another excuse for a party? Fun and games, right? Okay. So 'fetch your Sunday bonnet and the Irish flag you love so well, pin a shamrock to your lapel, and march to the beat of "Seniors living it up"'. Some will start with a good stiff shot of Irish Whiskey and chase it down with a pint of Green Beer. Others will rub their Blarney stone and set out looking for their pot of gold at the end of the rainbow. Some will begin the day eating green eggs and ham; others will be intently looking for leprechauns and 4-leaf clovers. The luck of the Irish, they call it. Is it? I say it's time for a party, what do you say? Whip up some corned beef and cabbage, Irish stew, breaded fish and chips, potato corn chowder, some potato cakes and Irish bread pudding and call in all your friends and family to enjoy the special day. What would a party be without St. Patricks Day games? Look at some of these special printable games for your party. 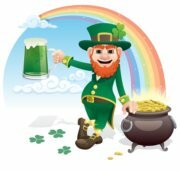 How about a friendly competition match between blokes of Leprechaun Mad Libs, US Beer Match, For The Love Of Leprechauns, or maybe your guests feel lucky and want to compete for the Matching Pot Of Gold. Throw in some refreshments a few gifts for the winners and a great party you have for all to enjoy! 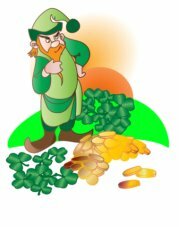 Your St Patricks day events could end or begin with a charity auction or a scavenger hunt, or just a group trip to watch the annual parade down Main Street. 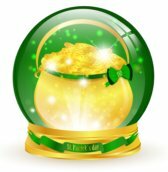 Open your mind to the many St Patricks Day party ideas and the variety of St Patricks games available to you before planning your event. 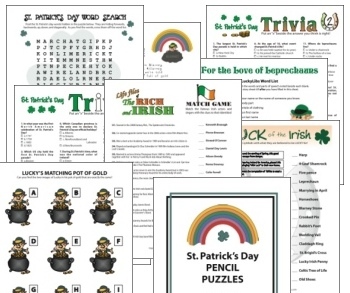 Entertain your guests with a friendly St Patrick's Bingo, some Leprechaun Riddles, or Where's That Pot Of Gold printable games. Let them try to out-do each other with Color Me Green or Irish Words Of Wisdom. smile upon you St Patrick's Day. Remember how fragile life is and how much joy you can bring to others with just one day; then proceed on your journey while marching to the beat of Seniors living it up! Happy St Patricks Day! 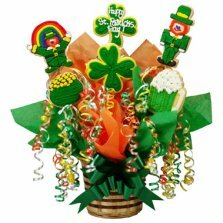 What a delicious and clever way to say Happy St. Patrick's Day! The message can be changed to express any sentiment - Happy Birthday, Get Well, or just Thinking of You.